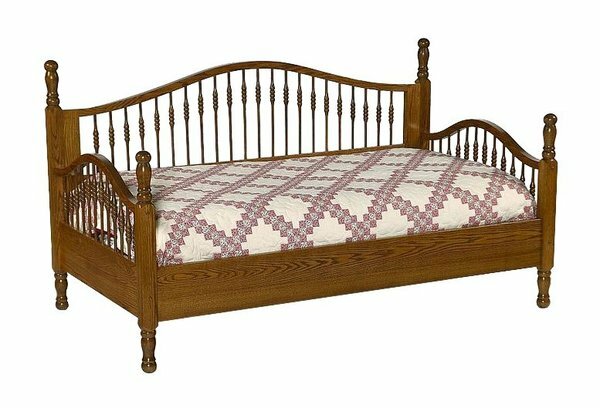 If you're in need of a bed that provides your guest room with the perfect place to relax or sleep, the Amish Spindle Day Bed is for you. Cozy up with fluffy pillows and thick comforters while watching a movie for family night! This solid hardwood, handcrafted bed is ideal for a child's room and all the slumber parties that come with it! With this classic day bed style, the possibilities are endless! Create a hospitable environment that keeps guests coming back and adds that extra 'oomph' to your home that you've been searching for. To complete the room, consider our Amish 42" Chest on Chest of Drawers. With plenty of drawer space, this handcrafted chest is sure to hold plenty of clothing, craft supplies, or knick knacks from around the house. Call one of our Amish furniture specialists today at 1-866-272-6773 with questions and learn about our options to customize this stunning day bed to match your decor! Stop by our Amish furniture store in Sarasota, Florida to view some of our fine selection in person. Height of Higher Post: 46"
Height of Lower Post: 36"
Hi, Jim! WOW!! We just finished putting the day bed together and it is absolutely GORGEOUS. The workmanship far exceeds any other day bed that I've seen. I couldn't be happier!! Yellow Freight brought the bed yesterday. It had been packaged very well and arrived in perfect condition. Please pass along my deepest appreciation to the woodcraftsman for his impeccable work. It's a family treasure now! !